Dr. Gregory Edie Halle-Ekane graduated from the University of Jos- Nigeria in 1985, obtained a specialist certificate in obstetrics and gynecology from the University of Yaoundé - Cameroon in 1994 and a postgraduate diploma in reproductive health from the University of Geneva in 1995. He subsequently trained in gynecologic laparoscopic surgery in the University of Geneva in 2002. 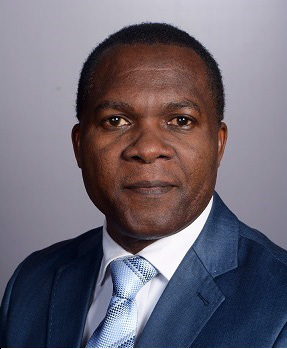 He is Vice Dean in charge of cooperation and Research in the Faculty of Health sciences, University of Buea - Cameroon, and senior consultant in department of obstetrics and gynecology in the Reference Hospital of Douala, a referral centre which serves the Central Africa sub-region. He is a researcher in sexual and reproductive health with experience in the management of STIs, gynecological cancer screening and management, teenage pregnancy, prevention of maternal to child transmission of HIV, pregnancy related complications like hypertension and caesarian deliveries. Dr. Halle-Ekane has been working as a gynaecologist obstetrician since 1994 and has worked as general practitioner and specialist in both the private and public sectors with different posts of responsibilities. He started teaching in the Faculty of Health Sciences, University of Buea in 2008 but has always assisted in teaching of some medical and paramedical personnel from the Universities of Yaoundé and Douala in Cameroon and Universities of Geneva and Lausanne in Switzerland. He is a lecturer in embryology, reproductive physiology, obstetrics and gynecology at the Faculty of Health Sciences, University of Buea. Dr. Halle Ekane was recruited as an obstetrician and Gynecologist in the Douala Reference Hospital in 2000. He is also a member of the National Medical Council of Nigeria, the National Medical Council of Cameroon, Cameroon Society of Obstetricians and Gynecologists (SOGOC), the Geneva Foundation for Medical Education and Research (GFMER) and associate member in other societies. Country’s Coordinator - Geneva Foundation for Medical Education and Research (GFMER) – Switzerland. Egbe TO, Ncham EN, Takang W, Egbe E-N, Halle-Ekane GE. Use of the partogram in the Bamenda health district, north-west region, Cameroon: a cross-sectional study. Gynecol Obstet Res Open J. 2016; 2(5):102-111. Palle J, Halle-Ekane G, Udoamaka GN, Assob NJC, Fokam P, Essoh NB and Epie MN. Bloodless Surgery in severely Anaemic Patients Who Need but Cannot Take Blood Transfusion: Two cases Report. AJIH, 2016;6 (1):8-12. Enow-Orock GE, Egbe OT, Halle EG, Ewane T, Verla V, Mengot BEN, Sando Z, Fewou A and Mboudou E. Plasma Cell-Rich Chronic Cervicitis. A Case Report. AJIH, 2016; 6 (1):5-7. Egbe TO, Halle-Ekane GE, Tchente NC, Nyemb SRNJE and Ngowe NM. Delivery After Laparoscopic Management of Heterotopic Pregnancy at the Douala General Hospital, Cameroon: A Case Report. AJIH, 2016; 6 (1):5-7. Fokam P, Farikou I, Halle EG, Palle J, Ngo Yamben MA. Outcome of the Management of Adolescent Tibial Tubercle Avulsion Fractures in Douala. AJIH 2016, 06(02):06-09. Gladys Ghogomu, Gregory E. Halle-Ekane , Peter F. Nde, John Ngunde Palle, Julius Atashili, Fulbert N. Mangala, Dickson Shey Nsagha. Prevalence and Predictors of Depression among Postpartum Mothers in the Limbe Health District, Cameroon: A Cross-Sectional Study. British Journal of Medicine and Medical Research. 2016; 12 (3):1-11. Gregory E. Halle-Ekane, Martin Che, Julius Atashili, Ndemazie Nkafu Bechem , Dickson S. Nsagha, Thomas Egbe Obinchemti, Peter Fon Nde. Severe Pregnancy Induced Hypertension, a Dreaded Complication in Semi-Urban Area in Fako Division, Cameroon? A Case – Control Study. British Journal of Medicine & Medical Research. 2016; 12 (5):1-9. Gregory Edie Halle-Ekane, John Cham Akwa, Dohbit Sama, Thomas Egbe Obinchemti, Charlotte Nguefack Tchente, Jacqueline Bih Nsom, Fulbert Nkwelle Mangala, Robinson Mbu. Knowledge, Attitudes and Practice of Contraception among Refugees in a Refugee Settlement in Yaoundé, Cameroun. International Journal of TROPICAL DISEASE & Health. 2016; 13 (1) 1-10. Gregory Edie Halle-Ekane, Francine Ketchem Emade, Ndemazie Nkafu Bechem, John N. Palle, Duplex Fongaing, Henri Essome, Nelson Fomulu. Prevalence and Risk Factors of Primary Postpartum Hemorrhage after Vaginal Deliveries in the Bonassama District Hospital, Cameroon. International Journal of TROPICAL DISEASE & Health. 2016;13 (2):1-12. Thomas Obinchemti Egbe, George Enonchong Enow-Orock, Gregory Edie Halle Ekane, Charlotte Nguefack Tchente, Eugene Belley-Priso. Laparoscopic Myomectomy in a Tertiary Care Centre in Douala, Cameroon. British Journal of Medicine & Medical Research. 2016;13 (7): 1-10. Charlotte Tchente Nguefack, Gregory Halle Ekane. Elvis Armand Ngoupeyou Yaya2, Théophile Nana Njamen, Jacques Tsingaing Kamgaing, Thomas Egbe Obinchemti, Eugène Belley Priso. Uterine rupture in Douala General Hospital, Cameroon: Prevalence, risk factors, management and prognosis. Health Sci. Dis. 2016;17(1)1-6. Thomas Obinchemti Egbe, Serah Ashunya Ketchen, Eta-Nkongho Egbe, Gregory Edie Halle Ekane, Eugene, Belley-Priso. Risk Factors and Barriers to Male Involvement in the Choice of Family Planning Methods in the Buea Health District, South West Region, Cameroon: A Cross-Sectional Study in a Semi-Urban Area. Women Health Open J. 2016; 1(3): 82-90. Thomas Obinchemti Egbe, Therence Nwana Dingana, Gregory Edie Halle-Ekane, Julius Atashili, Boniface Tatchwanglie Nasah. Determinants of Maternal Mortality in Mezam Division in the North West Region of Cameroon: A Community-based Case Control Study. International Journal of TROPICAL DISEASE & Health. 2016; 15 (2): 1-15. Thomas Obinchemti Egbe, Emmanuella Talla, Gregory Edie Halle-Ekane, Julius Atashili, Mary Bih Suh Atanga. The Effect of Performance-based Financing of Home Visitation in Overcoming Barriers to the Use of Modern Methods of Contraception in the Kumbo East Health District, Cameroon. International Journal of TROPICAL DISEASE & Health. 2016;15 (3): 1-12. Gregory Edie Halle Ekane, Fulbert George Nkwele Mangala, Thomas Egbe Obinchemti, Charlotte Tchuente Nguefack, Theophile Nana Njamen, Jacques Tsingaing Kamgaing, Eugene Belley Priso. A Review of Maternal Deaths at Douala General Hospital, Cameroon: The Referral System and Other Contributing Factors. International Journal of TROPICAL DISEASE & Health..2015; 8 (3): 124-133. Tebeu Pierre-Marie, Halle-Ekane Gregory, Da Itambi Maxwell, Enow Mbu Robinson, Mawamba Yvette, Fomulu Joseph Nelson. Maternal mortality in Cameroon: a university teaching hospital report. The Pan African Medical Journal. 2015;21:16. Halle Ekane GE, Djoukam L, Tchente Nguefack C, Tchouzou R, Atashili J, Mangala Nkwele, Mokube M, Egbe Obinchemti T. Outcome of delivery after a previous caesarean section at the Department of Obstetrics and Gynecology, Limbe Regional Hospital, Cameroon: A retrospective study. Afr.J. of Integ Health. 2015; 5 (1): 24-30. Gregory Edie Halle Ekane Edie, Thomas Egbe Obinchemti, Emmanuel Njuma Tamufor, Martin Mafany Njie, Theophile Nana Njamen, Eric Akum Achidi. Perceptions of antenatal care services by pregnant women attending government health centres in the Buea Health District, Cameroon: a cross sectional study. The Pan African Medical Journal. 2015; 21:45. Dickson Shey Nsagha, Elroy Patrick Weledji, Sarah Mboshi Nsagha, Faryu William Tantoh, Elvis Asangbeng Tanue, Anna Longdoh Njunda, Jules Clement Assob Nguedia, Edie Gregory Halle Ekane, George Enow-Orock. The Victories and Vexations of HIV and AIDS: An African Critical Public Health Perspective. American Journal of Epidemiology and Infectious Disease, 2015; 3 (3): 50-60. Essomba NE, Mbatchou Ngahane BH, Nida M4, Temfack E, Mapoure Njankouo Y, Abeng RL, Fokalbo ZK, Achu Joko H, Mbenoun M4, Meledie AP, Halle MP, Malongue A, Tchente C, Nana Njamen T, Halle Ekane G, Ngwane S, Barla E, Abena P, Ndobo P, Moungo Kuidjeu C, Adiogo D, Mouelle Sone A, Luma Namme H, Coppieters Y. Clinical and immunological profile of HIV-infected patients at the initiation of antiretroviral therapy in Douala. Bull Soc Pathol Exot. 2015;108(4):255-61. doi: 10.1007/s13149-015-0444-3. Epub 2015 Aug 22. C Tchente Nguefack, E Belley Priso, G Halle Ekane, LJ Fofack Tsabze, T Nana Njamen, J Tsingaing Kamgaing, G Beyiha. Complications et prise en charge de la prééclampsie sévère et de l’éclampsie à l’hôpital général de Douala. Revue de Médecine et de Pharmacie.2015;5(1):483-90. Gregory E. Halle-Ekane, Cyril Mela Fotabong, Phillip Nana Njotang, Julius Atashili, Ndemazie Nkafu Bechem, Dickson S. Nsagha, Thomas Egbe Obinchemti. Quality of antenatal care and outcome of pregnancy in a semi-urban area in Fako Division, Cameroon: a cross-sectional study. Women Health Open J. 2015; 1(2): 47-55. Halle-Ekane GE, Nsom BJ, Atashili J, Palle JN, Nsagha DS, Nguefack CT and Njotang PN. Outcome of Pregnancy in Patients with Excessive Gestational Weight Gain in Two District Hospitals in Douala, Cameroon. SM J Gynecol Obstet. 2015; 1(1):1004. Thomas Obinchemti Egbe , Amadeus Omeichu , Gregory Edie Halle-Ekane, Charlotte Nguefack Tchente, Eta-Nkongho Egbe, Jean-Francois Oury. Prevalence and outcome of teenage hospital births at the buea health district, South West Region, Cameroon. Reproductive Health (2015) 12:118 DOI 10.1186/s12978-015-0109-5. Halle-Ekane GE, Obinchemti TE, Nzang J-LN, Mokube NM, Njie MM, Njamen TN, Nasah BT. Assessment of the Content and Utilization of Antenatal Care Services in a Rural Community in Cameroon: A Cross-Sectional Study. Open Journal of Obstetrics and Gynecology. 2014;04(14):846–56. Halle-Ekane GE, Obinchemti TE, Tchente CN, Fokunang LK, Njamen TN, Bechem NN, Njie MM, Latum D. Attainment of the Fifth Millennium Development Goal: Utopia or Reality Based on Trends in Maternal Mortality in 12 Years in Two Regional Hospitals in Fako Division, Cameroon? A Retrospective Study. Open Journal of Obstetrics and Gynecology. 2014;04(13):771–81. Halle Ekane GE, Mangala NFG, Obinchemti TE, Nana NT, Tchente NC, Kamgaing TJ, Ngowe NM, Mouelle S, Biwole EM, Masson A, Belley PE. Assessment of the management of breast cancer in the Douala General Hospital, Cameroon: A tertiary centre in a low income setting. AJIH. 2014;03:12-8. Njunda LA, Elvuchio TEA, Eko MS, Tebit KE, Mary Ojong-Alasia MM, Halle Ekane EG. Cancerous lesions of the uterine cervix among women attending the University Teaching Hospital (UTH) Yaounde for screening: A cross sectional study. AJIH 2014;03:34-7. Shey Nsagha D, Halle-Ekane GE, Shei Nfor C, Ngowe Ngowe M, Tatchwanglie Nasah B. The Role of the Male Partner in the Prevention of Mother to Child Transmission of HIV in Cameroon. American Journal of Epidemiology and Infectious Disease. 2014 Mar 11;2(2):52–9. Palle JN, Bassah N, Kamga HLF, Nkwelang G, Akoachere JF, Mbianda E, Nwarie UG, Njunda AL, Assob NJC, Ekane GH, Ngowe MN. Current antibiotic susceptibility profile of the bacteria associated with Surgical wound infections in the Buea health district in Cameroon. African Journal of Clinical and Experimental Microbiology. 2013 Nov 20;15(1):27–34. Egbe TO, Nana Njamen T, Halle Ekane G, Tsingaing JK, Tchente CN, Beyiha G, Barla E, Nyemb E. Outcome of late second trimester emergency cerclage in patients with advanced cervical dilatation with bulging amniotic membranes: a report of six cases managed at the douala general hospital, cameroon. ISRN Obstet Gynecol. 2013;2013843158. Halle Ekane G, Tebeu PM, Obinchemti TE, Njamen TN, Nguefack CT, Kamgaing JT, Priso EB. Postpartum hemoperitoneum due to rupture of a blood vessel on a uterine pseudo tumor: a case report. Pan African Medical Journal. 2013;16. Mokube MN, Atashili J, Halle-Ekane GE, Ikomey GM, Ndumbe PM. Bacteriuria amongst pregnant women in the Buea Health District, Cameroon: prevalence, predictors, antibiotic susceptibility patterns and diagnosis. PLoS ONE. 2013;8(8):e71086. Nguefack CT, Biwole ME, Massom A, Kamgaing JT, Njamen TN, Halle Ekane G, Obinchemti TE, Priso EB. Epidemiology and surgical management of breast cancer in gynecological department of Douala General Hospital. Pan Afr Med J. 2012;1335. Tebeu PM, Halle G, Lemogoum D, Simo Wambo AG, Kengne Fosso G, Fomulu JN. Risk factors for eclampsia among patients with pregnancy-related hypertension at Maroua Regional Hospital, Cameroon. Int J Gynaecol Obstet. 2012 Sep;118(3):254–6. Tchente NC, Halle-Ekane G, Egbe OT, Tsingaing JJ, Nana NT, Belley Priso E. L’insuffisance ovarienne précoce: review de la littérature a partir de 4 cas cliniques observes a l’Hôpital Général de Douala, Cameroun. Revue de Médecine et de Pharmacie. 2011;00:37–41. Tebeu PM, Mboudou E, Halle G, Kongnyuy E, Nkwabong E, Fomulu JN. Risk factors of delivery by caesarean section in cameroon (2003-2004): a regional hospital report. ISRN Obstet Gynecol. 2011;2011791319. Tsingaing KJ, Egbe OT, Halle-Ekane G, Tchente Nguefack C, Nana Njamen T, Imandy G, Fanne M, Barla ME, Mvele ED, Belley Priso E. Prévalence du VIH chez la Femme Enceinte et Transmission Mere-Enfant du VIH a la Maternité de Hôpital Général de Douala, Cameroun. Clin Mother Child Health. 2011;8. Tebeu PM, Kemfang JD, Sandjong DI, Kongnyuy E, Halle G, Doh AS. Geographic Distribution of Childbirth among Adolescents in Cameroon from 2003 to 2005. Obstet Gynecol Int. 2010;2010. Egbe TO, Halle-Ekane G, Behiya G, Tsingaing JK, Belley Priso E, Nyemb JE. Importance of prenatal diagnosis in the effective management of hydrocephalic foetus: A case report in the Douala General Hospital, Cameroon. Clin Mother Child Health. 2010;7(1): 1233–8. Robyr R, Nazeer S, Vassilakos P, Matute JC, Sando Z, Halle G, Mbakop A, Campana A. Feasibility of cytology-based cervical cancer screening in rural Cameroon. Acta Cytol. 2002 Dec;46(6):1110–6. Leke RIJ, Halle-Ekane G, Tonye R. Efficacité et tolerance Bactox dans les syndromes infectieux abdomino-pelvien à la Maternité Principale – Yaoundé. Medicine digest. 1992; 13(4). Cameroon is situated in the Golf of Guinea, extending from the Atlantic Ocean in the south to Lake Tchad in the north. It lies between the 2nd and 13th Latitudes and the 9th and 16th Longitudes. Cameroon has a surface area of 475 442 square kilometers that spans the equatorial dense forest in the South and the arid region in the North. It has an estimated population of 20 million inhabitants. It became independent in 1960 after being colonized by France and Britain after the Second World War. English and French are the official languages but there is much socio-cultural diversity marked by the existence of more than 200 dialects. The health care system is organized in a pyramidal form with the existence of basic health centers in both urban and rural areas and specialist hospitals that are located mainly in the regional head quarters. Sexual Reproductive health is an integral part of the health care system at all levels of in Cameroon. The co-operation between the Swiss and Cameroon governments permitted conventions to be signed between certain Cantons in Switzerland and Divisions in Cameroon to improve on the health care system in Cameroon. At the level of the Universities, many postgraduate students from the University of Yaoundé benefited from Swiss scholarships which offered them an opportunity to do part of the specialist training in the Universities of Geneva and Lausanne. In the domain of obstetrics and gynecology, the collaboration has been crowned by the fact that since 1992 some resident doctors from the department of obstetrics and gynecology from University of Yaoundé, Cameroon obtained a postgraduate diploma in reproductive health after completing the course in Geneva. A similar course was organized in the Department of obstetrics and gynecology, University of Yaoundé, in 2004 and 2007 under the auspices of the Ministries of Health and Higher Education. The contribution most of these doctors have made in the domain of sexual reproductive health at the local and national level has been immense. These doctors have established a network which permits them to discuss, develop research projects and intervene to solve some pressing issues in the domain of the sexual reproductive health. Vulgarize GFMER activities in Cameroon and abroad. Creation of more awareness among GFMER members on the importance of strong collaboration in order to tackle issues in sexual reproductive health in Cameroon. Organization of training seminars for medical and paramedical personnel on the role of Evidence based medicine in the management of conditions like pre-eclampsia and eclampsia and post partum hemorrhage. Encourage training of medical personnel by participating in programmes organized by GFMER.